Surge capacity that we rapidly expanded with to meet last year’s (2016) hyperactivity. Which is pretty much what all major firearms companies, that could afford to do so, did in the years leading up to the momentous election of this past November. The Democratic Party, whose base and donors are not that friendly to firearms rights, held on to the White House for eight years, and for part of those eight years, had a majority in Congress. A situation like this spurred massive sales in the firearms industry. As the 2016 election loomed, and it was predicted (obviously erroneously) that Hillary Rodham Clinton would become President, along with a Democratic rout of Congress, the sales figures for anything related to firearms exploded into overdrive. Companies staffed up, expanded production capacity, and started cranking out products at a feverish pace. Shipments of firearms would hit popular FFLs, and be off the shelves or at least spoken for, a few hours later. Ammunition of most popular calibers was scarce, with retailers often limiting patrons on purchase amounts. Ranges had wait times of over an hour for a lane. After a few high-profile shootings, everyone wanted an AR-15, and companies rose to the challenge and started spitting them out. After the unfortunate and horrifying incident at Pulse Nightclub in Orlando last June, it took me almost 3 weeks to receive a lower receiver, and I had placed the order immediately after the terrible news came in. The demand was just that insanely high. Fast forward to November, and in a stunning upset, Donald J Trump beat all expectations and won the Presidential election. Firearms owners, expecting to engage in another round of feverish purchasing before HRC assumed office and started in on gun control efforts, were shocked, and yes, relieved, whether they liked Donald Trump or not. The industry, used to the steady rise and spikes of the past eight years, was as equally shocked. The best gun salesman in the world? Some termed Barack Obama, and by extension, the Democrats, as the “best gun salespeople in the world”. Regardless of whether there was a notorious shooting incident or not, the Democrats have always been about gun control. Eight years of varying levels of Democratic control had conditioned the industry to just produce items, since people were buying them as fast as they could get them. Guns are unusual in that respect - the more ‘noise’ to regulate and ban them, the more people tend to buy them. Major innovations weren’t necessary - just crank out a functional product, and someone would be along shortly to buy it. Get your FFL, tool up, and start producing ARs - people would buy them. The rifles didn’t have to do anything better than other AR companies’ guns, they just had to function to spec, not break any records. Not to say innovations didn’t happen in the years between 2008 and 2016, but for the most part, a firearm from 2016 wasn’t too much more advanced than one from 2008. Accessories had incremental improvements, but a PMAG from 2009 probably works just as well as a 2016 PMAG. Innovations came in the forms of support, ergonomics, and marketing, but the firearms themselves remained largely the same. Since there was no reason to innovate - people bought whatever they could get there hands on. It’s 2017. Whether you love him or hate him, Donald Trump is President of the United States. The Republicans have a supermajority in the House, a simple majority in the Senate, and with the confirmation of Neal Gorsuch, the Supreme Court is (thankfully, in my honest opinion), leaning conservative still. The firearms industry, as of this moment, is like the dog that caught the squirrel. After so many years of chasing, it finally (kind of) got it, and now it doesn’t know what to do. Well, what to do? Simple - innovate. Keep holding the torch to support the right to keep and bear arms for all Americans, and take some of “breathing room” afforded by the legislative environment, to look into new product lines and techniques. Help pass the Hearing Protection Act and help deregulate suppressors, and open up a whole new mass market for the industry. All those guys and gals who bought ARs during the panic years would love to have a cheap can. Research new markets - remember that the Second Amendment is for everyone and not just for the tacticool crowd. Girls, gays, lesbians, trans folk, and so on have the right to defend themselves too. Heck, everyone has the right to own a machine gun for fun as far as I’m concerned. Ergonomics: Sure, any gun can fire a bullet reliably, but to do it accurately and comfortably for a shooter is an art that takes mastery. I’ve already begun to see this start to happen on a significant level. 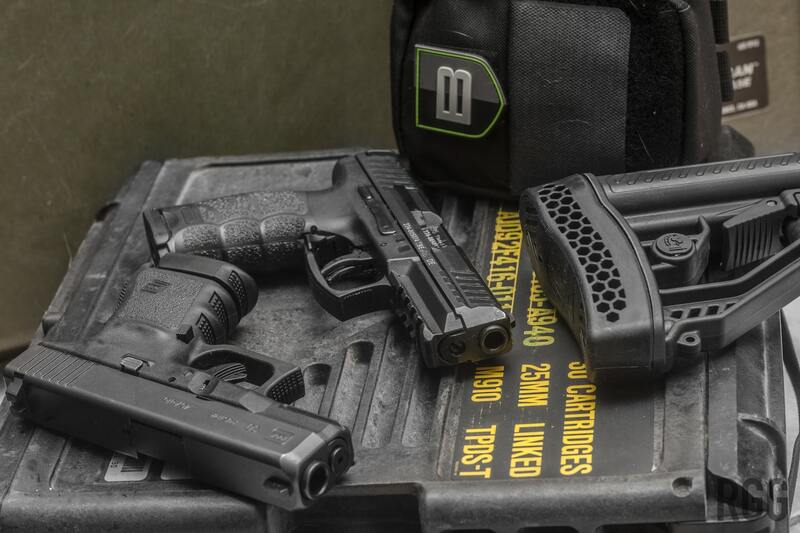 Hudson Manufacturing has debuted their H9 9mm pistol, with some striking ergonomic features including a very low bore axis, which basically means the recoil impulse goes more towards the “meaty” part of your hand, allowing for greater accuracy, comfort, and control. Adaptive Tactical recently sent me a demo unit (review coming soon) of their EX Performance AR stock, which has a lightweight and generous buttpad that looks comfortable enough to lie down on and rest. Accessories, especially in the AR world: A lot of people picked up AR-pattern rifles from 2008 - 2016. And those people are going to want to accessorize them. Stocks, grips, scopes, holographic sights, magazines, and so on - come up with some new must-have thing you can hang off of a rail and people will pick it up. Encourage AR owners to undertake aftermarket modification, as well. Sell them the rifle, but then sell them on uppers of a different barrel length or caliber, for example. While it’s nice to have multiple ARs, a lot of people may just have one or two, and not really want to buy more, due to cost or storage needs. Get them hooked on some complete uppers, and they can have ten rifles in one, and not break the bank or take up a lot of space at home. Get away from the AR platform: ARs are great, and pretty ubiquitous. I love the ones I have, and am building more. But I’d love to see different approaches to the idea of a modern rifle. I’ve seen an interesting concept from M+M called the M10X, which combines features from the AK world, and the AR world, for something that appears to be pretty fresh and new. A company called Skelico has a rifle called the X11, chambered in 5.56mm, which takes standard AR magazines and has interesting features like a quick-change barrel, side-charging, ambidextrous controls and ejection, and a piston-driven operating system - purportedly for an insanely low price point. Off-the-rack premium options: I love tinkering with rifles and building them, but sometimes I don’t have time to do so. While it can only be pushed so far, offering premium options on rifles as purchased or shipped can be attractive to some markets, especially urbanites who may not have the space or time to build out an AR from scratch. I’ve said it before, but I think GNAR is on to something with their configurator. Make it yours before it even ships. New markets: Not everyone is a tacticool door-kicker. While imagery of operators operating operationally looks super-cool and is a lot of fun to produce, it can be intimidating to some people, even if the product featured is pretty tame and bog-standard. For example, if you build ARs for a living, invest in some marketing targeted at regular guys and girls. Picture an everyday guy in his home, preparing to engage a threat with your product. Or of an everyday girl doing the same. Heck, go wild and depict non-traditional couples using your product to defend themselves. A mind-blowing ad campaign would center on an LGBTQ couple confronting an assailant with drawn GLOCKs. Support the Hearing Protection Act and open up a new market: Suppressors are great. I own a Silencerco Specwar 762 and it’s pretty awesome. Suppressor companies have been innovating to make their products more efficient, and cheaper, but they can only do so much due to the stifling regulations surrounding suppressors. Open up the market, treat cans like normal firearms, and watch the market explode. In nations like New Zealand, where even though guns themselves are pretty restricted, suppressors are classified as regular accessories, and one can acquire disposable plastic cans for around $100 - good enough for a few trips to the range or a day out hunting. The market is open, and companies produce within the entire cost range. It could happen here too, with costs invariably going down and sales volume going up. Every industry experiences this. There’s a mad rush for something, then the market levels off. Look at smartphones. There used to be lines for the iPhone and it was in super-high demand. Now, each iteration is only an evolution, not a revolution. People have them, and they upgrade occasionally, but the mad rush days are over for Apple. Apple adjusted, and added accessories and services to their offerings. Apple Watch, Apple Music, HBO Now, rumors of Apple establishing a Sling TV-like service, they saw their golden goose going away, and they adjusted. The firearms industry is more susceptible to legislation than Apple, sure, but the conditions are similar in a way. The firearms industry isn’t going to go away, people will still buy GLOCKs, ARs, shotguns, and so on. There’s always someone new looking to get in, and they aren’t going to start with a wündergun. However, the industry needs to keep them, and everyone else, interested and engaged. Panics give short-term gains, but as a long-term business tactic, relying on panic is ill-advised. Seek out new markets, protect the existing ones, and innovate, for guaranteed success and longevity.